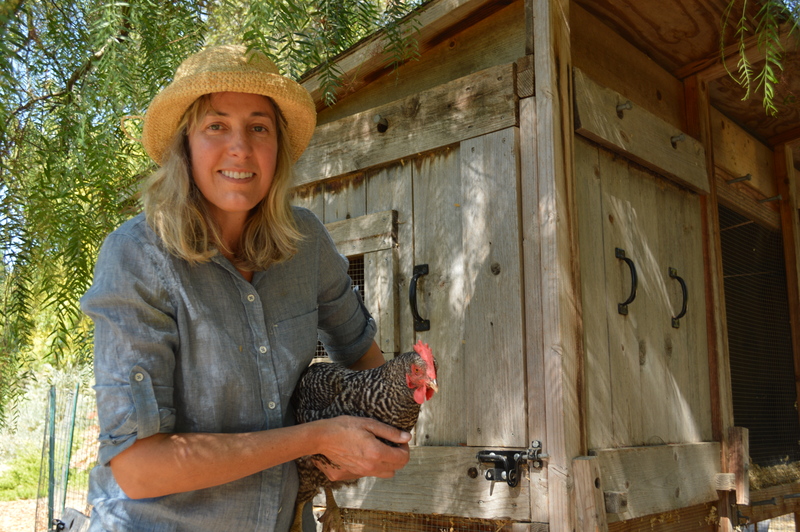 Rustic and low-tech with minimal investment, Campo Cluckers coop is situated in a former apricot orchard beaneath a mature pepper tree. The coop is a very sturdy 4’x8′ two story wood structure that was acquired two years ago from Stanford Community Garden when it was relocated. The four hens who inhabit the coop were received from a neighbor. They’ve been with us since April and they are about 3-1/2 years old. 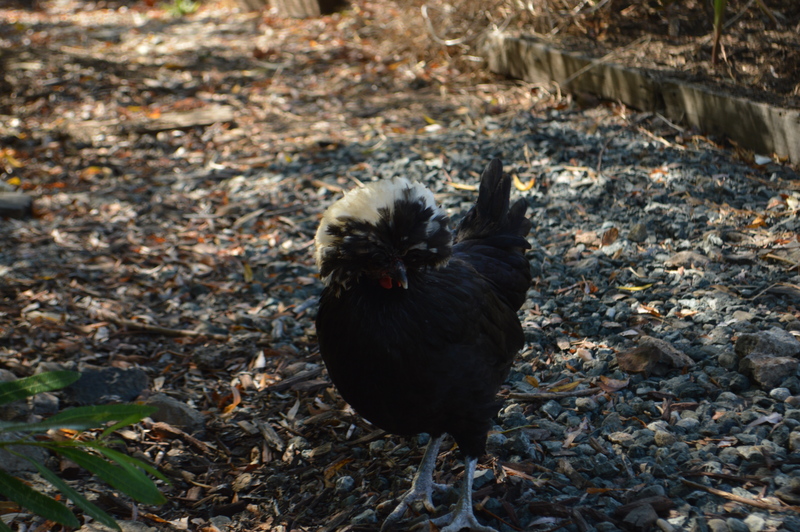 The occupants are “Chuckles” an Ameraucana who lays turquoise eggs; “Red” our Rhode Island Red and “Flecks”, the Plymouth Rock both lay light brownish-tan eggs and “Cher” aka “Snowball” is the Polish Crested hen who lays white eggs, when she lays them. Our property has been on well water exclusively since 1950. Formerly an apricot orchard, the space is still wide open with just a few remaining apricot trees. 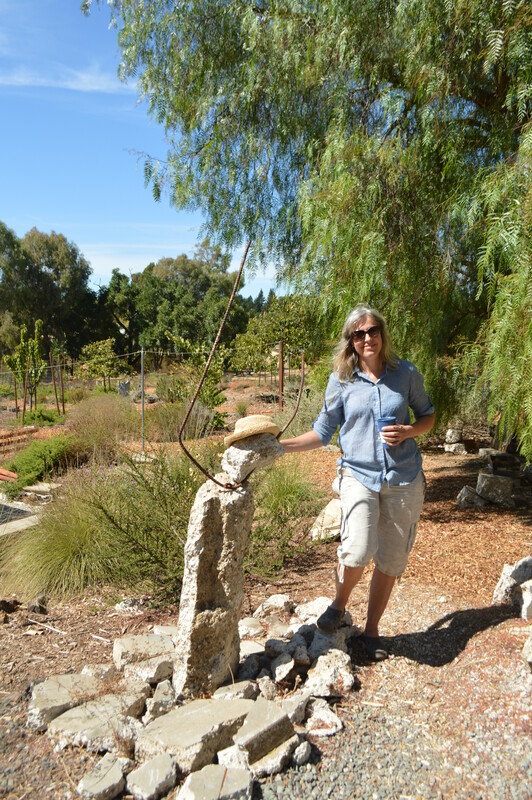 We’ve lived at our site for five years and started the garden from nearly a blank canvas first with sheet mulching the wild oat cover crop and then planting California natives. California native plant specimens: prostrate coyote bush, quail bush, St. Catherine’s lace buckwheat, toyon, western sycamore, coast live oak, Howard McMinn manzanita, Stanford manzanita, tarweed, lilac verbena, deergrass, ceanothus and California fuchsia. Young fruit trees you can see include pomegranate, Asian pear, multi-grafted pear, apple, cherry, olive, Fuyu persimmon and a Thompson grape vine. A mature Hachiya persimmon provides a shady, moist habitat for the hens to explore and get cover from hawks and falcons. 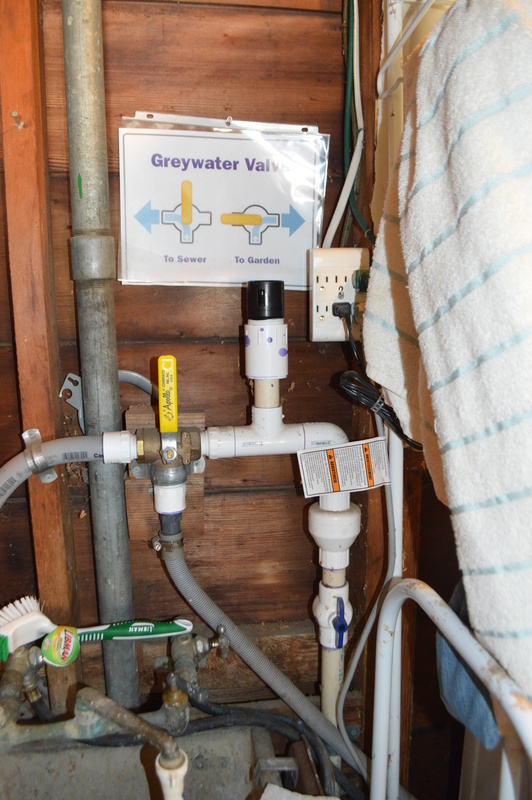 Graywater has been diverted from the washing machine to water four of the fruit trees. Managing drainage and rainfall have been a necessity and a priority. Our home is located at the base of a small hill that receives a lot of water runoff in winter. 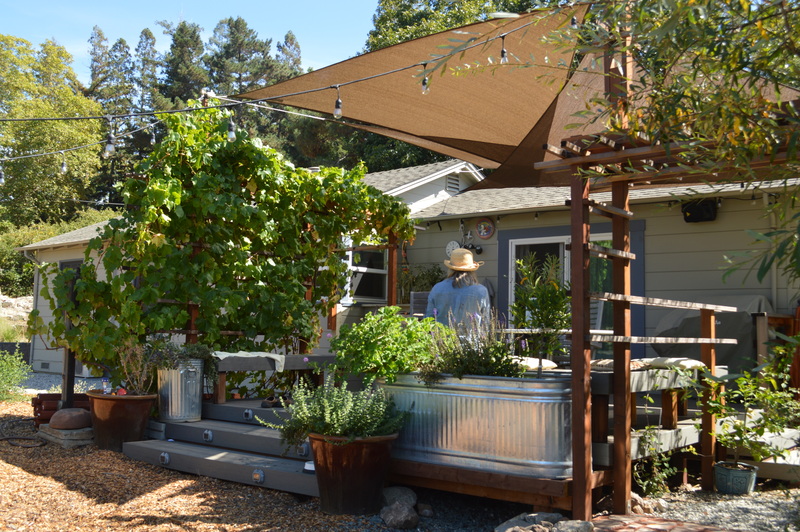 Utilizing the permaculture principle of “slow it, sink it, spread it” to manage runoff, we have used permeable materials for driveway and pathways. We installed a culvert pipe to direct the water that pours off Campo Vista Lane onto our property so the water can be slowed until it percolates into the soil instead of running into the storm drain below. Swales were created to slow and direct the water towards our garden. Yards of tree mulch have been added on top of the open field to absorb rainfall and let it sink into the ground. Reuse of urbanite for a pathway, a wall, a bench, borders, a sculpture, and other small projects. You will see the swales as well and our water tank when you approach the property. The driveway is best approached by foot or bike as many cars can create dust this time of year. Shady places to sit and water will be available.